This specimen was collected from Cabeceras del Rio Bobonaza, Pastaza, Ecuador. 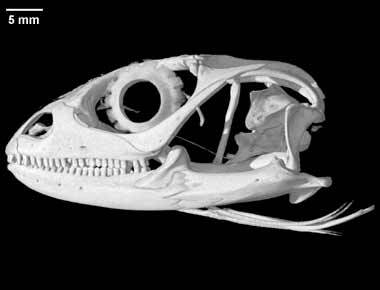 It was made available to The University of Texas High-Resolution X-ray CT Facility for scanning by Dr. Jessie Maisano of The University of Texas at Austin and Dr. Kevin de Queiroz of the National Museum of Natural History. Funding for scanning and image processing was provided by a National Science Foundation Assembling the Tree of Life grant (EF-0334961), The Deep Scaly Project: Resolving Squamate Phylogeny using Genomic and Morphological Approaches, to Drs. Jacques Gauthier of Yale University, Maureen Kearney (formerly of the Field Museum), Mike Lee of the University of Adelaide, Jessie Maisano of The University of Texas at Austin, Todd Reeder of San Diego State University, Olivier Rieppel of the Field Museum, Jack Sites of Brigham Young University, and John Wiens of the University of Arizona. The specimen was scanned by Matthew Colbert on 24 January 2005 along the coronal axis for a total of 555 slices. Each slice is 0.076 mm thick, with an interslice spacing of 0.076 mm and a field of reconstruction of 31 mm. Wiens, J. J. and R. E. Etheridge. 2003. Phylogenetic relationships of hoplocercid lizards: coding and combining meristic, morphometric, and polymorphic data using step matrices. Herpetologica 59:375-398. Three-dimensional volumetric renderings of the skull with the osteoderms, scleral ossicles, hyoid and jaw removed, and of the isolated left mandible. All are 2mb or less. 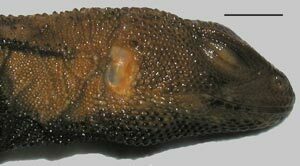 To cite this page: The Deep Scaly Project, 2015, "Morunasaurus annularis" (On-line), Digital Morphology. Accessed April 25, 2019 at http://digimorph.org/specimens/Morunasaurus_annularis/.